Several months ago a Texas FACS teacher sent me a message suggesting that I create a lesson on this topic. I loved the idea and immediately had ideas swirling in my head. However, before sharing, I wanted to try it out with my own child development students to make sure everything went as I envisioned. Thankfully, The lesson and activities went according to plan and students had a lot to say about this topic and some great discussions ensued! If you have suggestions for future lesson and/or activities, send me a message and I’ll take a look! Begin by asking students to complete the “Cartoon Analysis and Title this Picture” introductory activity. Ask students to share their responses, picture titles and thoughts/concerns. Discuss that sometimes it seems as if children are born with “screens” aka cell phones/electronic devices in their hands, often knowing how to use the technology better than many adults. View this YouTube clip as an example. 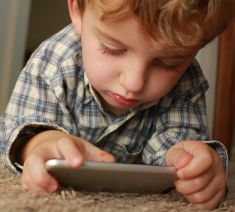 Ask the following questions: Are all of these “screens” helping or hindering the developing child? For many parents, educators and caregivers, there is concern. Is their concern justified or unwarranted? Your role will be to explore and research this topic so that you can complete some follow-up assignments. Read this article: The Actual Effects of Screen Time on Kids’Development and use the information to complete the below chart, answer a writing prompt and establish some guidelines for screen use regarding young children (See attachments). After discussing with students the effects of screen time on a child’s development, their thoughts on whether screens were helping or hindering children’s development and some guidelines for use, I asked students to look for engaging activities that young children could participate in that were screen-free as they created an infographic style visual called “Engaged 5 Ways”. Students then shared their visuals and ideas with the class in order to illustrate the variety of ways to engage young without screens. As concluding activities, I shared with students two parodies via YouTube of classic children’s books and we discussed how they related to what they learned. Parody #1: If You Give a Mouse an iPhone and Parody #2: Goodnight iPad. I also asked them to complete an exit slip in Google Classroom (assigned as an ASK question) with the following prompt: What is/are the key/keys to children using “screens” in a healthy way? Note: The intent is not to avoid all screens throughout the lives of young children, as that would not be a realistic approach in today’s technological age. However, the key to their use is parental/adult monitored use, time limits and of course balance between screen and screen-free activities for a well rounded and developed child. Image courtesy of Hal Gatewood via Unsplash.